Review: IT, Stephen King’s 1986 novel was a popular book in my junior high library. At 1,138 pages and with only one copy though, the waitlist was long and I believe it took nearly the entire school year to obtain. I remember when I finally got my hands on it and marveling at its creepy cover, fretting over the length, and reading it by flashlight late into the night. Trouble was, by the time it was due back I was only halfway through and though as an adult I’ve carried (lugged would be a better word) a paperback version with me for the past six months, absorption by osmosis did not occur and to this day I’ve regretted never finishing it properly. Most people, though, will have experienced IT for the first time via the 1990 made-for-TV movie that scared several generations of people over the two nights it aired. At the time I remember thinking the film quite entertaining but watching it again a year or so ago I found myself wincing more than cowering. The trappings of an era with more rigid television standards robbed it of being too scary or slick. While some of what goes on in King’s novel could (and should) never be depicted on film, today it feels toothless though it does find prime moments to gnaw your nerves. Then there’s the clown. Mention IT to a crowd and you’re going to get a response. They either hate it or they love it and the reason why is almost always the same…that damn clown. It’s impossible to think of IT and not conjure up the vision of Tim Curry as Pennywise the Dancing Clown. While the movie itself may have lost some bite over the years, Curry’s menacing monster in clown’s clothing has perhaps become more terrifying. So while many were welcoming of a new adaptation of IT on the big screen, one of the biggest question marks was how well Bill Skarsgård (Atomic Blonde) would fill Curry’s admired shoes. Patience, dear reader, patience. IT arrives at the end of a disappointing summer at the box office and before the wave of award seeking films are released. The timing couldn’t be better. Kids are back in school and the weather here in the Midwest has taken a cold turn. Walking into the packed theater and taking my seat for the screening there was a palpable excitement for the lights to go down, a buzz of anticipation I hadn’t felt for a while. 135 minutes later the lights came up on an audience that had screamed, laughed, and applauded. In short, IT’s a winner. In the late ‘80s, something bad is happening in Derry, Maine. Kids are disappearing without a trace and no one knows why. Is it related the town’s history of bad luck or is something more sinister taking place? One thing’s for sure, a frightening clown has been haunting and hunting and his appetite is insatiable. A team of young outcasts band together to uncover the secrets of their town while battling their own phobias brought to life by the monster on the loose. Though it had a bumpy road to the silver screen thanks to budget cuts and the departure of its original director, the wait was worth it. Director Andy Muschietti (Mama) has delivered a quality film that not only provides delirious scares but has an ambitious emotional resonance extending far beyond its genre. I admit I got a little misty eyed as the film was wrapping up…when was the last time you went into a film expecting terror but found a tear or two eeking out? Equal parts Stand By Me, Stranger Things, and The Goonies, it’s retro-feel is unobtrusive and navigating prolonged sequences of horror while maintaining energy is no easy task but Muschietti makes it look simple. Scaredy-cats will have their limits mightily tested while fright fans are going to be nicely satisfied with the pulse-raising shocks doled out by Muschietti and company. 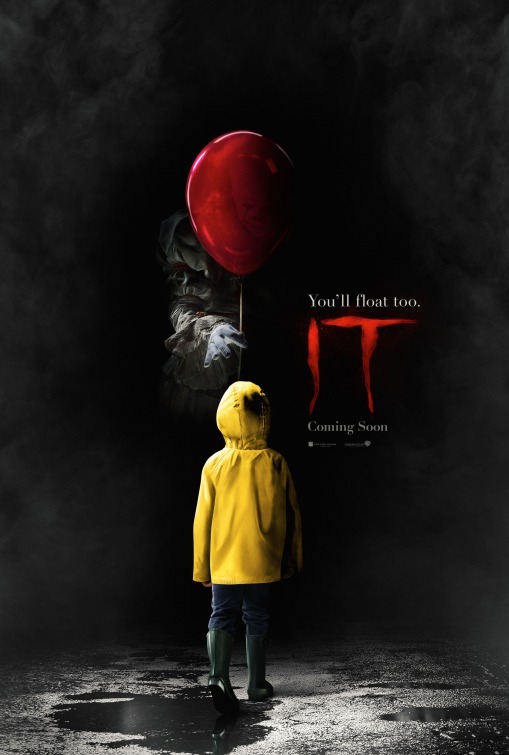 None of the good directorial decisions or the solid script would amount to a hill of beans if the actors didn’t measure up but Muschietti has cast the film splendidly. Though Jaeden Lieberher (Midnight Special) has top billing, this is an ensemble piece and the kids are definitely all right. I especially liked Jeremy Ray Taylor’s roly poly new kid on the block and Sophia Lillis as the only girl holding her own in the boys club. Not all the acting is consistently convincing but it’s a small-ish nitpick in the grand scheme of things. In a cast made up primarily of unknowns, it’s an interesting decision for Muschietti to further conceal some of the adult actors under prosthetics and fat suits. A few times the adults gave me the same type of goosebumps brought on by Pennywise, further isolating the children as they realize they are the only townsfolk they can truly trust. Some of the more extreme side plots of King’s original novel have been softened or excised and more’s the better for it. There’s enough peril for the youngsters to deal with whenever that clown makes an appearance. Ah yes…the clown. While Curry may be seen as the definitive Pennywise, Skarsgård makes the role entirely his own, bringing a sharp physicality to his clown that amps up the danger of his visits. Though he has precious few lines this is a performance based almost entirely on presence and Skarsgård is pretty electric in the film. Balancing childlike clown mannerisms with a serial killer’s alacrity, when he opens his bloodthirsty maw to consume or frighten it will shake you to your core. While the studio had originally intended to film the novel as one long movie, budget fears were such that IT covers roughly half of the book. The movie is so good and the early buzz so strong I can’t imagine we won’t get a sequel in short order…but it makes you wonder why they didn’t just stick to the original game plan to begin with. In any event, IT is awesome which should please fans of the novel (even those that only finished half of it) as well as devotees of the TV movie. Scare you it does and scare you it shall.